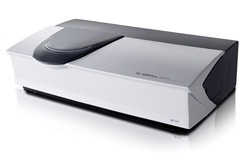 The IG-1000 Received Pittcon 2009 Editors Choice Bronze Award. This instrument uses the induced grating (IG) method, which is based on a new principle for measuring the size of nanoparticles using the phenomenon of dielectrophoresis and diffracted light. 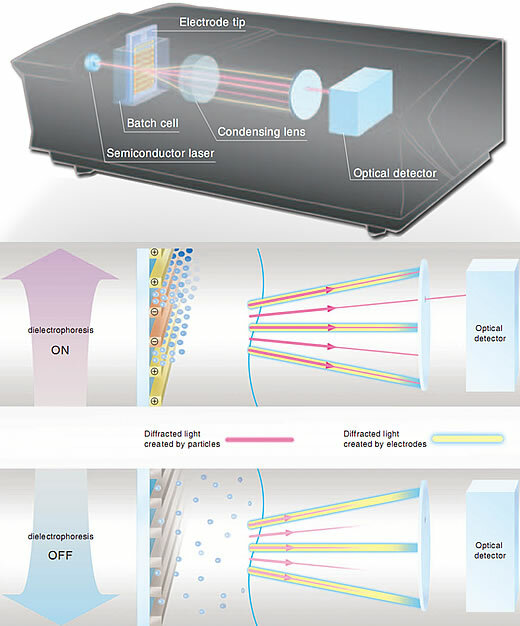 With dynamic light scattering, the conventional method, the light scattered by particles decreases sharply for particle sizes of less than 100 nm. Furthermore, in the single nano region (i.e., particle sizes of less than 10 nm), there are physical restrictions that make it difficult to detect scattered light, and the measurement of particle sizes also becomes difficult. The IG method does not use scattered light and so it is free from these physical restrictions, and does not require the input of the refractive index as a measurement condition. It therefore allows the size of nanoparticles to be measured simply and with high sensitivity,and is particularly effective in the analysis of single nanoparticles. Optical signals emitted by the diffraction grating formed by the particles, not scattered light emitted by the particles, is used for measurement and so, even in the single nano region, a sufficient S/N ratio can be obtained, and stable measurement with good reproducibility is possible. The new measurement principle is resistant to contamination and so, even if the sample is mixed with small amounts of foreign particles, information about the particles to be analyzed is still caputured. Therefore the filtering of samples in order to remove coarse particles is not required. The new measurement method ensures high reproducibility and the acquisition of stable data. In particular, high reproducibility for particle sizes of less than 10 nm removes the uncertainty and vagueness of particle analysis in the single nano region. Also, comparison with raw data of diffracted light is possible and so rough validation of the measurement results can be performed simply. What Is the "Induced Grating Method"? The concentration of nanoparticles expresses itself as the amount of change in the refractive index of the medium and so if a cyclic concentration distribution of the particles is formed in the medium by an external force, it functions as a diffraction grating. If the external force is removed, the diffraction grating disappears. With the IG method, the decay process of this particle density diffraction grating is measured via the change in intensity of the diffracted light, and a diffusion coefficient is obtained. An alternating voltage is applied to cyclically arranged electrodes, and a cyclic concentration distribution of microscopic particles is formed in the liquid by dielectrophoresis. Although the cyclic concentration distribution of microscopic particles acts as a diffraction grating (a particle concentration diffraction grating), if the alternating voltage is stopped, the grating diffuses and disappears (patent pending). The cyclically arranged electrodes also function as a diffraction grating. The diffracted light created by this electrode diffraction grating is weaker than the diffracted light created by the particle concentration diffraction grating, and in order to precisely measure the changes in the primary diffracted light resulting from the diffusion of the particle concentration diffraction grating, it is ensured that the positions of the two forms of primary diffracted light do not coincide. For this reason, the electrode configuration has been modified as shown in the figure so that the pitch of the electrode diffraction grating is half that of the particle concentration diffraction grating (patent pending).